The 64-0x printers combine the outstanding features of its high-performance class and optimised printing of RFID labels. Based on a 32-bit CPU it ensures unbeatable print results with a print speed of up to 400 mm/s and a resolution of 300 dpi. Not only that, it is exceptionally reliable and economical. The standard Ethernet connection allows simple integration into existing data processing systems. To protect both, chip and print head, the printer menu includes a special parameter setting to define the position of the chip. The intelligent near-edge print head lifts at the defined position or automatically if it encounters print-free area of greater than 6 mm (if the layout of the label has been designed around the position of the transponder). The UHF standard opens new ways in RFID tracking and tracing. As only an EPC is stored to the chip, less data capacity is required. This EPC is a link to a database which contains the complete set of information. The speed of the data reading process is increased – even from wide distances. These advantages make the UHF tag the most suitable solution for packaging labelling, answering the strong demand for more cost efficiency. In RFID applications, the direct thermal or thermal transfer printer equipped with a read/write module, is used to print a human readable label at the same time the data is stored to the RFID chip. In order to transfer data to the chip, the 64-05 RFID printer is fitted with a UHF read/write module and an antenna. The components of the RFID kit are factory-fitted and can also be retrofitted to existing 64-05 printers. The HF transponder features a high data storage capacity which allows, for example, in the product’s value chain, to add the complete history at each point of the production and handling flow directly on the label. It is applicable in processes with shorter reading distances. 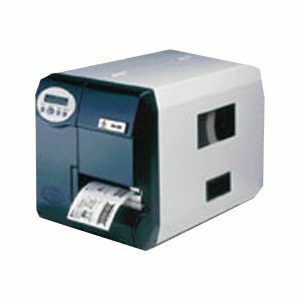 In RFID applications the direct thermal or thermal transfer printer equipped with a read/write module, is used to print a human readable label at the same time the data is stored to the RFID chip. In order to transfer the data to the chip, the 64-0x RFID printer is fitted with a standard HF 13,56 MHz read/write module, as well as a variable antenna. The positions of antenna and chip can be aligned easily. The components of the RFID kit are factory-fitted and can also be retrofitted to existing 64-0x printers.